Reading the Hypothetical (and extremely fictional) story. Checking out the ‘Things to consider’ section. And then…. Voting for the option you would choose if you were walking in this person’s shoes. Let’s get the conversation started…. It’s early 2016. Sticking with his promise to continue with Abbott’s policies on climate change, Malcolm Turnbull and his new Immigration Minister share a ‘private’ Joke about our Pacific Island neighbours soon being underwater. In keeping with tradition, they do this in front of a microphone while waiting for a press conference to start and their joke is broadcast to the world. When the President of Kiribati hears about this, he is furious. “Let’s see how Australians like losing their country” he shouts and storms out to Kiribati’s little known [because it’s fictional] nuclear missile launch base. With the press of a few large red buttons marked ‘Danger’ and ‘Are you really sure?”, he launches a nuclear strike on all Australia’s major cities. Within an hour, just over 80% of Australia’s population is wiped out, and nuclear fallout threatens the remaining 20% by turning Australia into a nuclear wasteland. The only Australian Territory not impacted by the attack is Christmas Island. Luckily the ABC regional radio network withstood the blast, and regional broadcasters advise that all surviving Australians should make their way to a specific list of small ports around the Australian coastline where Australian naval vessels will collect survivors and transport you to Christmas Island. The UNHCR is on there way to Christmas Island and will be setting up tents for survivors to live in. You, your partner and kids were holidaying at a coastal resort up north when the missiles hit. The resort is a long way from any major cities, so you survived the blast and haven’t yet felt any effects. But you know that your home in Perth is gone – blown to pieces. And with nuclear fallout spreading across the country, you need to start working out what you and your family are going to do next. Then you learn that the US is sending in planes to pick up American survivors who are also staying at the same resort as you. Some of them suggest that you and your family should go back to the USA with them. But having left your passports at home, you’d have to go without the proper travel documents and claim asylum once you reached America. You have no idea whether they would accept you since they, like Australia, are not all that keen on people seeking refuge in their country. And as all Australian banks have been wiped out, and Australian currency now has no value, you would head there with no money and no way to support yourself and your family. Option one : Stay where you are – in the coastal resort, and try and make a living there. But if nuclear fallout doesn’t get you, it’s possible that further attacks from the irritated Kiribati President will. Option two: Make your way to one of the designated departure ports and go to Christmas island. But you’ve already been warned that there may be as many as four million people there – all trying to fit into 135 square kilometers. Plus, there’s no guarantee Kiribati won’t try to finish the job and attack Christmas Island at a later date. Option three: Try and sneak onto one of the US planes sent to rescue American citizens, and hope you can get to America and seek asylum there, knowing that they may very well turn you around and send you back. Or lock you up in a Detention Centre. In the real world, being forced to flee your home due to war or conflict is not hypothetical for many people – it is very real. In fact, in 2014 some 42,500 people per day were forced to flee their homes in order to seek safety elsewhere. Unsurprisingly, just as most Australians love Australia, and would be reluctant to leave here – many people who are forced by conflict to flee their homes stay in their national country and try to find somewhere safer, hoping that one day they can return to their home town/city. At the end of 2014, according to the UNHCR there were 38.2 million people who had fled their homes but stayed in their home country. They are classified by the UN as Internally Displaced People or ‘IDP’s. The most common reason for IDPs having to flee their home currently is attack by non-state armed (or terrorist) groups such as ISIS or the Lord’s Resistance Army (a Christian extremist group in Uganda seeking to rule Uganda according to Old Testament law). Where they can, IDPs stay with family in other locations within their home country. Others stay in camps – some run by their governments and some by the UN. But often they are forced to flee from location to location as local conflicts escalate. A relatively small number of people who flee their homes subsequently seek asylum elsewhere. 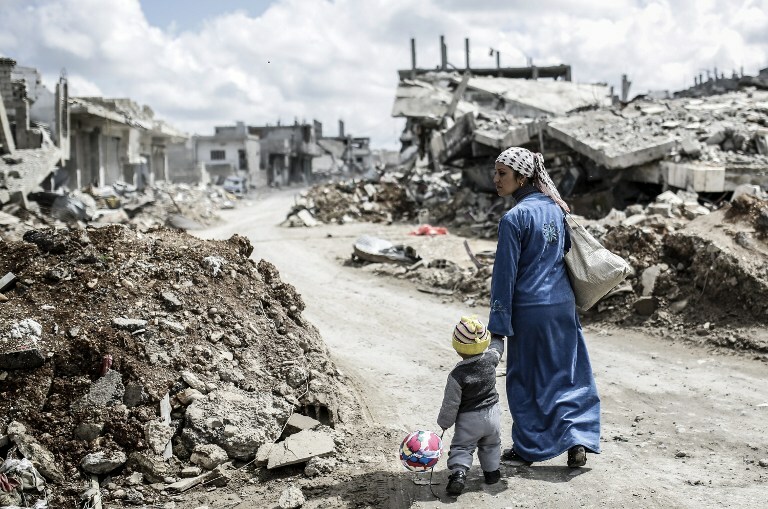 In 2014, according to the UNHCR, 1.7 million people left their home country to seek asylum elsewhere – although this number is likely to be much larger in 2015 due to increased warfare in Syria alone. By way of example, at the end of 2014 there were 7.6 million IDPs in Syria. Unfortunately fewer than 3% of them were in official camps. The rest were staying with family, host families or renting accommodation for as long as they could afford to do so. But as the conflict escalates, more and more of them have no choice but to cross the borders of Syria and seek asylum or refuge in another country – which is why we’re seeing the scenes of Syrian refugees in Europe right now, desperately trying to find a country to take them in. 4. What option would you choose and why? So what would you do if you were in the hypothetical person’s shoes above? Would you stay on the Australian mainland, and take your chances avoiding radiation poisoning and further attacks? Would you head up to Christmas Island – the last remaining non-nuked part of Australia, and hope that all 4 million surviving Aussies can fit there. Or would you and your family try to sneak onto the plane to America and seek refuge there? And don’t forget to add any comments or thoughts you have about why you chose a particular option below. In case you’ve had better things to do than think about hypothetical situations before, the purpose is to try to imagine what you would do in a completely different set of circumstances to those that you are normally faced with. In this instance, I have deliberately picked a highly unlikely and somewhat ridiculous situation, because I want the focus to be on the options, rather than the story itself. So try to see past the fact that it is pretty much impossible that Kiribati would nuke Australia, and consider what it would be like if something did happen to your home and your city more broadly which meant you had no choice but to leave and seek refuge elsewhere. I’m no fan of the terrible refugee policies of recent Australian governments, nor the bigoted hysteria bubbling up in Europe, but as someone who might be broadly in your camp I think you didn’t extend the hypothetical to the issues that concern the Turn Back The Boats crowd and so will not engage them. They are indifferent about IDPs. They don’t even care about the unequal distribution of the global refugee burden, in fact they welcome it – fewer of ‘them’ coming ‘over here’ and rhubarb rhubarb etc. They’re not worried about New York Times editorials or the possibility that some day there could be some kind of sanctions by unknown numbers of countries of indeterminate relevance… and hey, someone has to be 23rd in a list of hundreds. That was in reference to your ‘No place to put your feet’ post. A Liberal Party voter might say that talk of “our fair share” is meaningless. We didn’t create the problem, we have no share. Now that might be highly debatable with regards to specific conflict zones that Australia has objectively made worse, but usually it’s a position the majority of Australia can be expected to agree with. After all, this is the standard approach to terrible things happening in far-off lands – do something temporary and tokenistic, but not really our problem. Don’t bring it over here. A large part of what animates anti-refugee sentiment in Australia is the observation that geographically we are just about the last stop in a chain of countries in which life isn’t easy but it also isn’t oppressive or persecutory. Of course that simplifies and has misleading omissions, but it’s a powerful argument in a world where empathy even for one’s fellow citizens is in short supply, let alone for a potentially threatening Other. How do you respond to these nationalistic challenges? Can you do so by extending the hypothetical? Hi Alison. Thanks for the comment. Th eone thing that surprised me from the article was the number of people who voted to stay in Australia, despite the almost certain expectation of death – in the hypothetical situation that is. I guess that’s why so many are still in places like Syria. The desire to stay ‘home’ is strong. I know it would be for me.